I'm sure you're familiar with them. A fair amount of information, although some of it turned out to be inaccurate, especially with regards to cold hardiness. 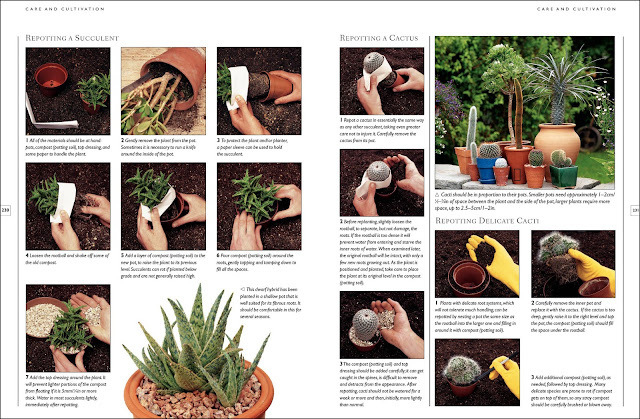 Or advice like adding peat moss to your soil. But there was one area where these books really sucked: images. Photos were either dull and grainy or weirdly oversaturated. The print quality was mediocre, resulting in an altogether unsatisfying product. Of course that's seen through today's lens. At the time, it was what is was. We've come a long way since then. 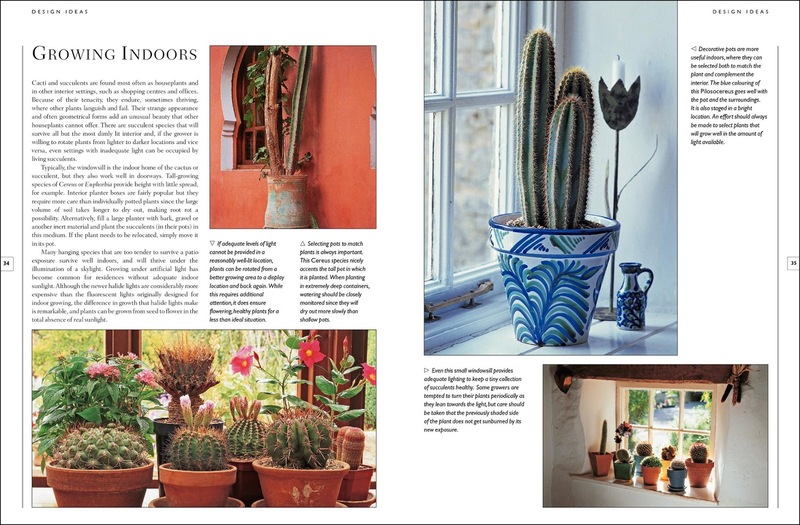 Not just in terms of photo and print quality, but also in the way books are written and designed. The book I'm reviewing in this post is a perfect case in point. 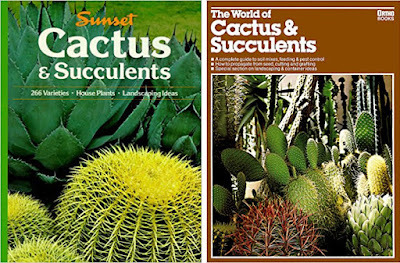 I'm always on the lookout for a good succulent reference for beginners that I can recommend. It needs to be full of relevant information, starting with basic botany and then going into a decent amount of detail about care and cultivation, maintenance, pest control and other practical aspects. 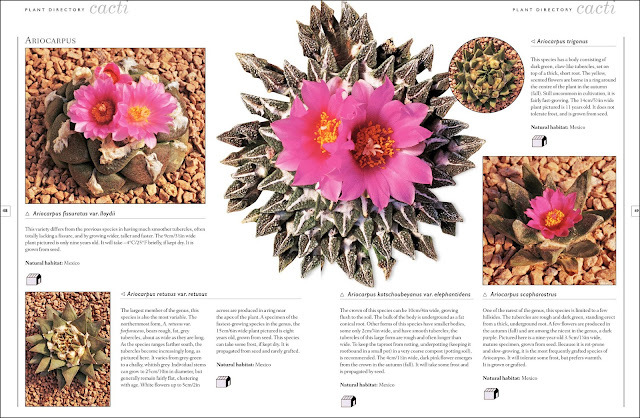 A representative sampling of commonly grown cacti and succulents should round out the book. I've finally found the title I was looking for. I came across it on Amazon purely by chance and couldn't believe I had missed it before. 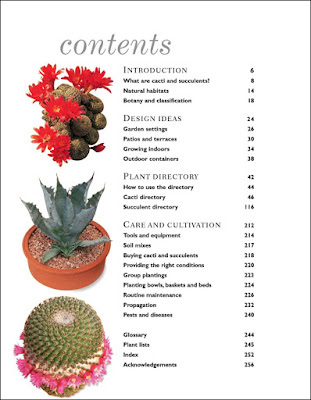 The Complete Illustrated Guide to Growing Cacti & Succulents (Southwater, 2012) was written by Miles Anderson with contributions from Terry Hewitt. Some of you may recognize the name Miles Anderson. 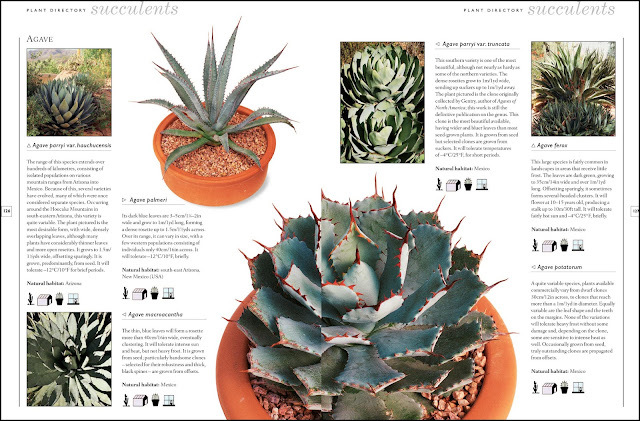 He's a renowned succulent expert from Tucson, AZ and runs Miles' To Go, an iconic mail-order nursery. At the Sacramento Cactus & Succulent Society we routinely order from Miles for our monthly drawing, and his plants are always top quality. 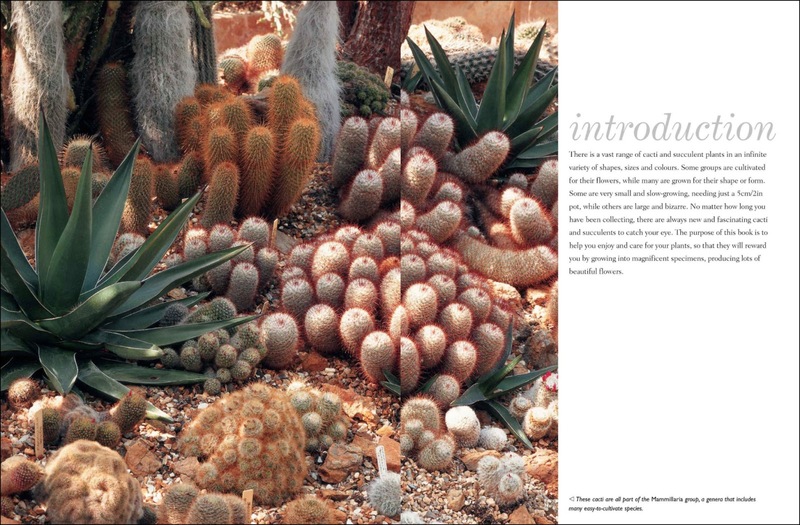 The Complete Illustrated Guide to Growing Cacti & Succulents combines the best photography and writing I could hope for in this kind of book. On 264 pages, there are over 700 (!) photos. They illustrate not only the plants described but also step-by-step procedures on pruning, repotting, and propagation. 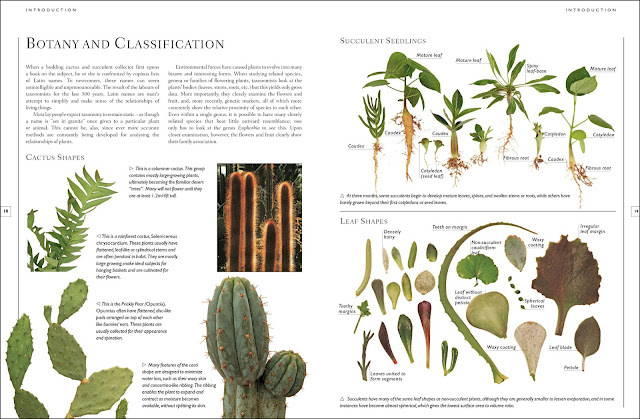 The introduction contains basic information about botany and classification, explained in such a way that even novices can follow along. The illustrations are exemplary. How come most books don't use visuals to present information in such a clear and straightforward way? After all, there's a good reason for the phrase "a picture is worth a thousand words!" The "Design Ideas" chapter contains general information about growing succulents in gardens, on patios and terraces, indoors, and in greenhouses. More experienced readers may not need advice in that department, but the photos are beautiful and may give you a jolt of inspiration. 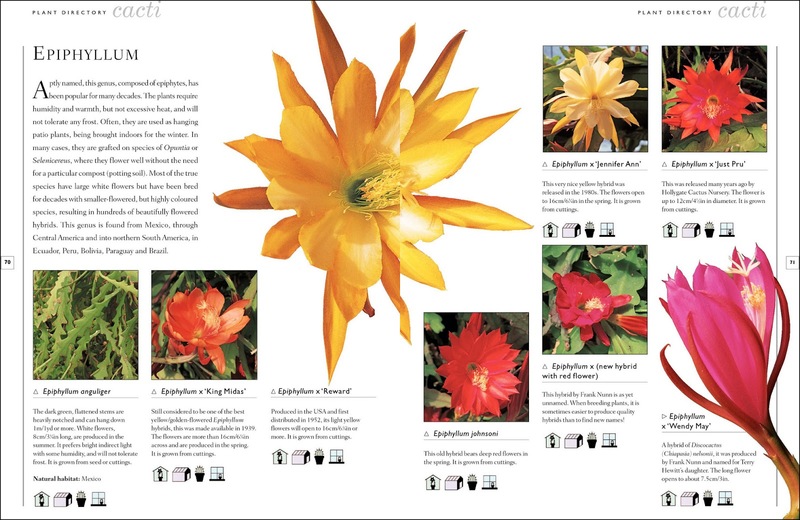 The bulk of the book is the 170-page plant directory featuring over 400 species. With so much territory to cover, there isn't much room for each individual species, but Miles Anderson manages to pack a lot of information into each paragraph, including cultivation and cold hardiness. As you'll see below, each entry is richly illustrated. 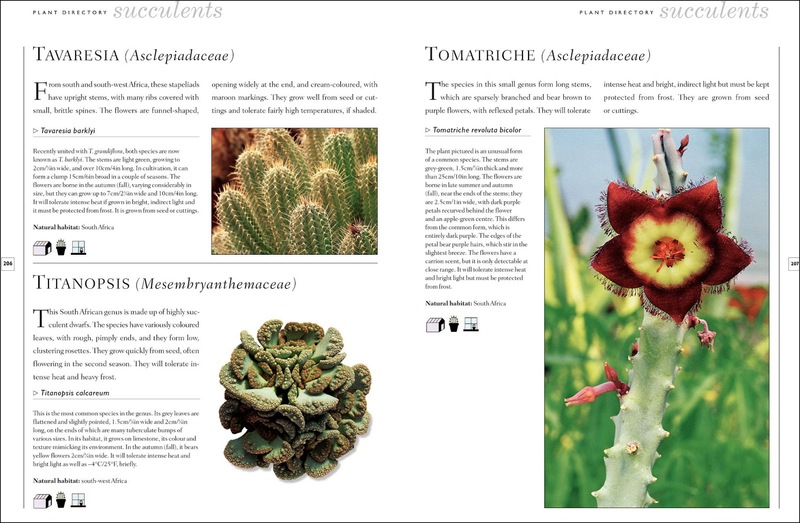 In addition to all the popular cactus and succulent genera, Miles also introduces us to some truly exotic plants, many of which I had never even heard of before. 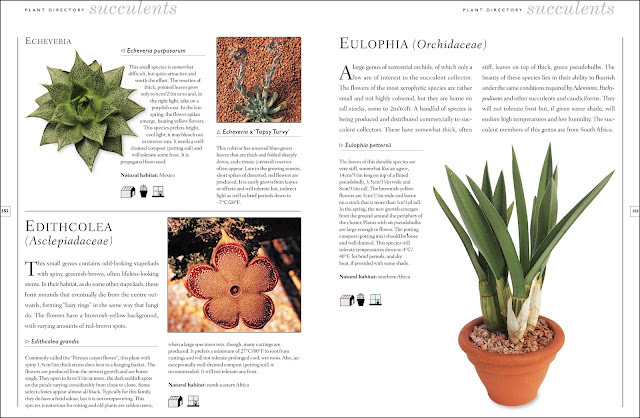 Edithcolea or Eulophia, anyone? How about Tavaresia, Titanopsis or Tomatriche? Tomatriche looks particularly attractive even though it sounds like a tomato-based ceviche dish. 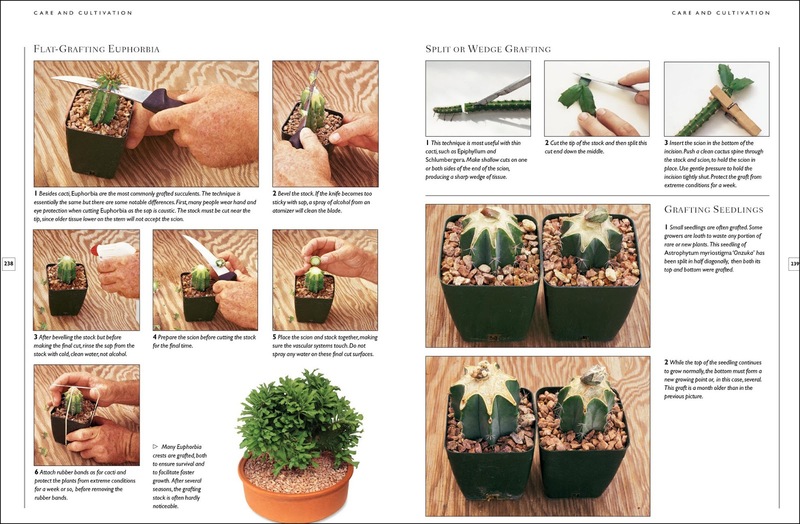 The hands-on sections are prime examples of what a how-to reference should be: brief step-by-step explanations, each accompanied by a pertinent photo. 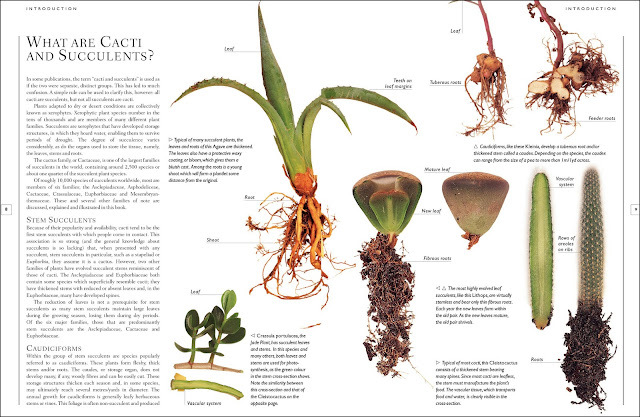 There is no better way to present such information in print. ...and propagation. 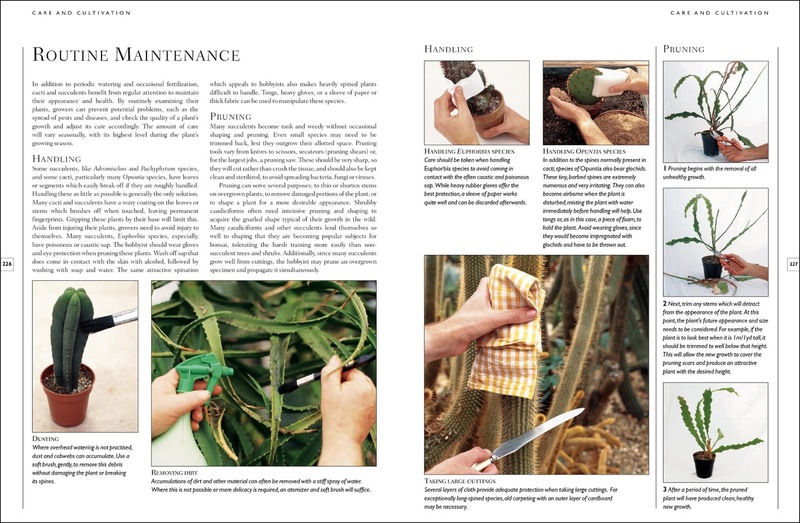 The propagation chapter covers not only methods we're all familiar with—seeds, stem and leaf cuttings, divisions, even cross-pollination—but also demonstrates several grafting techniques such as flat grafting and split or wedge grafting. 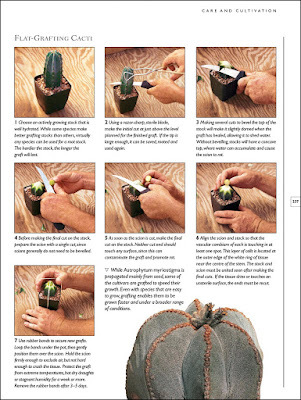 I've never grafted cacti before so this was all new to me. 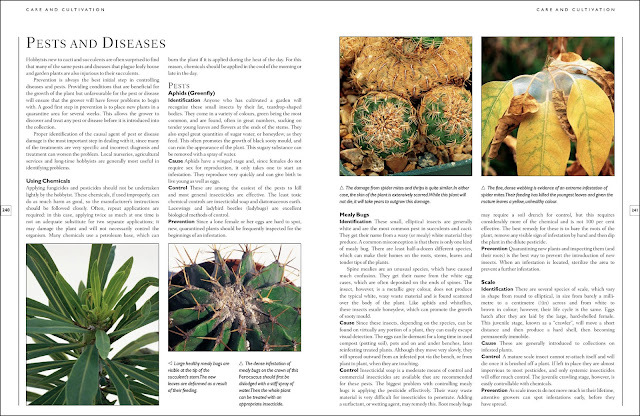 Four pages of hands-on information on how to identify, control and prevent a variety of pests and diseases round out the book. 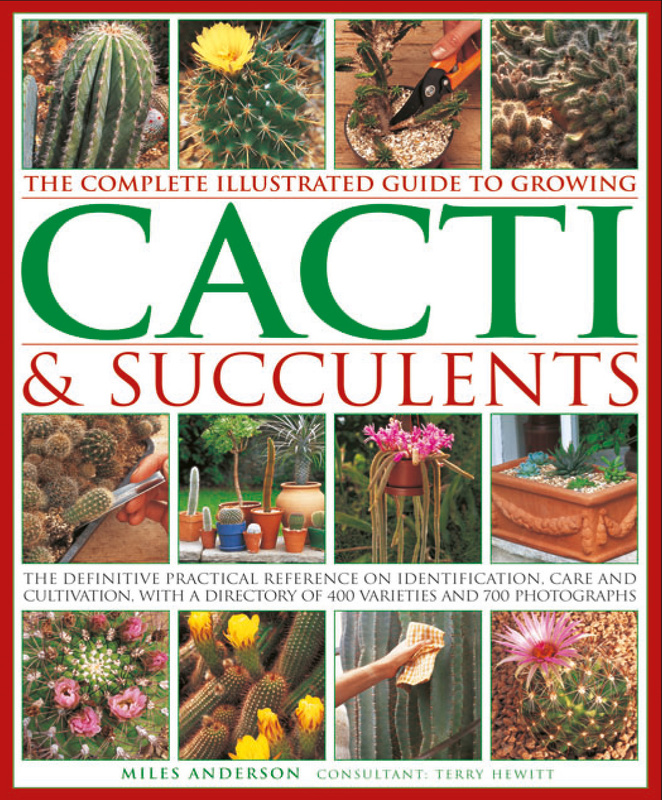 If there is one reference every succulent lover should have, The Complete Illustrated Guide to Growing Cacti & Succulents is it. It sets beginners on the path to success and helps more experienced collectors and gardeners expand their succulent horizons. 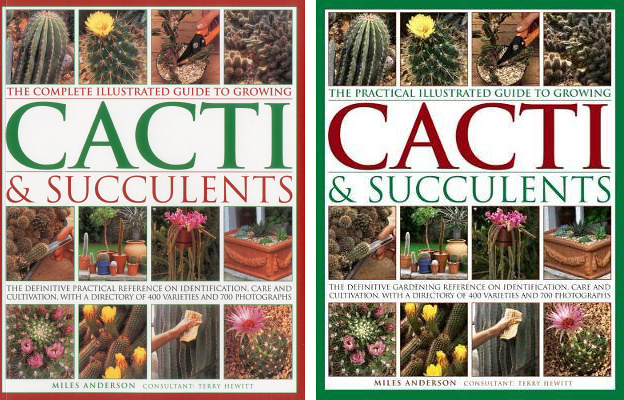 At $16.99 (under $13 online), The Complete Illustrated Guide to Growing Cacti & Succulents gives you truly big bang for your buck. A "new" version of this book is coming out in January 2018. 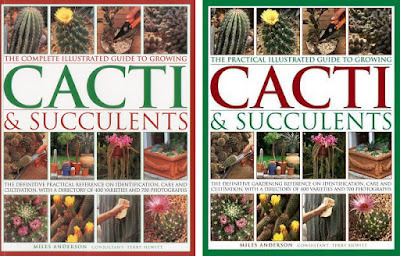 Entitled The Practical Illustrated Guide to Growing Cacti & Succulents, it's actually the same book, just in hardcover and published under a different imprint of Anness Publishing (Lorenz instead of Southwater). 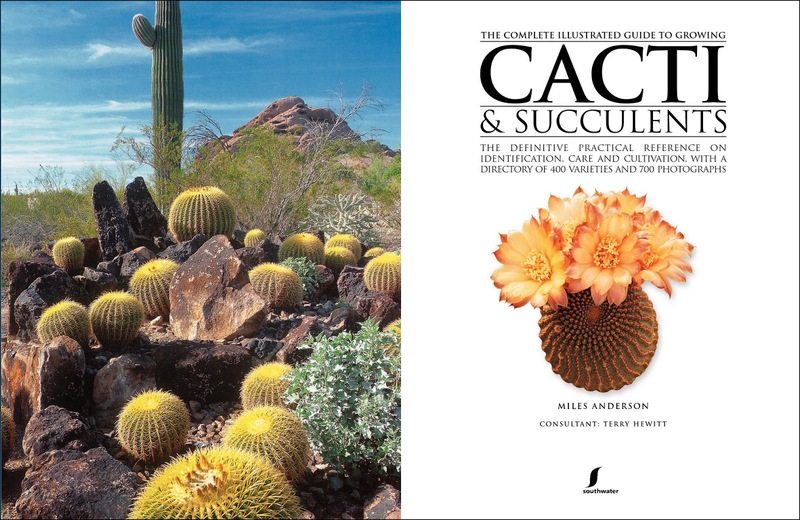 Get the version you prefer: softcover (Complete Illustrated Guide) or hardcover (Practical Illustrated Guide). 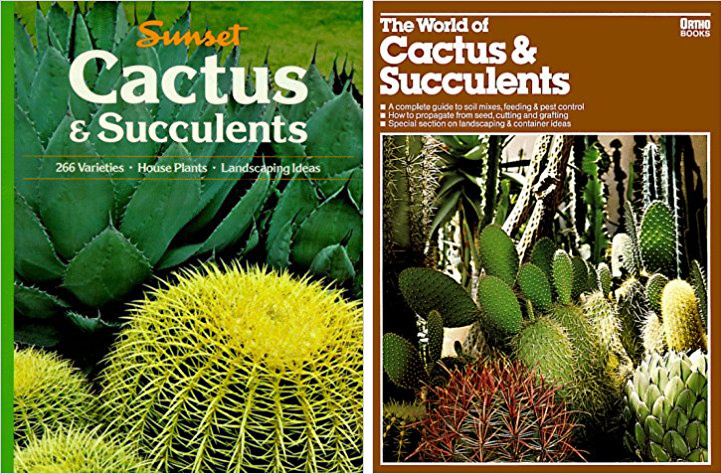 In closing, I'd like to give a big shoutout to Lisa Tai and Simon Wilder, the designers of The Complete Illustrated Guide to Growing Cacti & Succulents. They turned what must have been a mountain of information and imagery into a coherent, visually stimulating and eminently reader-friendly product. Looks like a winner! Hopefully the publishers will find your review and link to it. You do the best book reviews! And I still don't own a general reference book on succulents -- this looks like a good place to start! I’ve got a lot of the old Sunset and Ortho books, they really are too generalized for me too. I’ve got an even older book by Miles Anderson, from 2000, it was printed in the UK. “The Ultimate Book of Cactus and Succulents” ...but so many new plants since then. Playing serious catch-up – really, really need to get off Instagram once in a while for the pleasure of reading beautiful gardening blogs. Anyhow, I can’t wait for your in-depth posts on the glorious LA area gardens, and I also have to thank you for this great book review! My copy of The Complete Guide arrived from Amazon today, and it looks fantastic. Going to enjoy diving in for a good read after dinner. A belated Happy New Year, Gerhard! !